Nachdem ich heute mein M’era Luna T-shirt anhabe und wir schon länger über Karlsruher Diskos, DJ Mozart und schwarzgekleidete Leute geredet haben, habe ich soeben nochmal den alten Bericht über das M’era Luna 2004 gelesen. Ein wirklich denkwürdiges Festival und der Bericht hat ein Zweit Lesen durchaus verdient. Dieses Jahr wirds wohl nix mit Festivals … das M’Era Luna ist am 9./10. August und ist noch nicht ausverkauft … ? Need Festival. Mal wieder ordentlich Epixe abgestaubt. Ok nichts davon ist lila … aber was solls. Der Schlüssel zur neuen Wohnung – ich hab dann beschlossen dass es Unfug wäre den gesamten Schlüssel abzulichten … Paranoia ftw. Und … ich hab endlich die Wackentickets besorgt … der Typ an der Kasse vom Ticketforum hat schon etwas geguckt als ich meinte ich hätte gerne 7 Tickets für Wacken. Allzuviele Tickets gibt es nicht mehr, das Wacken Open Air ist fast ausverkauft! Wer also noch mit uns und vielen tausend anderen Freaks – vermutlich im Regen – Bier trinken, lauter Musik lauschen und Steaks grillen will …. muss sich beeilen. 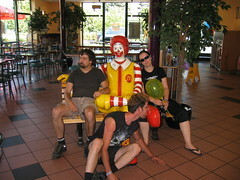 McDoof Afterparty (Originally uploaded by yashima): Reposting the famous picture on our way home from M’era Luna 2004. Apparently there is an annual goth meet at disneyland or so boing boing writes. Same topic, different thought: what happens to peoples private web pages when they die? Currently this is probably not a big problem since the net and it’s citizens are still young. Of those that die young the pages are (if they are known at all) probably kept. Don’t know why I had to think of that, but the question did occur to me before …. Koennt ihr noch springen? von Gerhard auf dem “Inofficial Newgods Blog”. # wo bleiben die Bilder von unseren Leuten??? 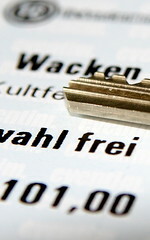 Anreise fuer Armin, Gerhard, Rolland und mich. Geplante Abfahrt 11 Uhr tatsaechliche Abfahrt 12:15. Das Packen war etwas kompliziert, aber am Ende ging der Kofferraum doch zu, der Kasten Bier musste leider daheim bleiben. Zwischenstop: Burger King. Blue Energy mit Vodka? Stattdessen ein Sixpack aus der Tanke daneben. Bier in der Sauna ist wirklich ….. aehm bleibt wirklich nicht lange kalt. Ankunft auf dem Festivalgelaende ca. 19 Uhr. Das Gelaende machte um 16 Uhr auf, aber es war 3 Stunden spaeter schon kaum noch ein freies Plaetzchen zu finden fuer unsere vier Zelte. Irgendwie gelang es uns doch – auch ohne meine Beteiligung – also es gelang quasi den anderen, die Zelte so aufzubauen, dass man noch aus den Eingaengen rauskam und sogar noch Platz für ein knappes Dutzend Campingstuehle war! So Alex is going to M’era Luna this week-end. So am I 🙂 Guess who I’ll see there this week-end? He says he doesn’t consider himself a “goth”, I don’t either but it’s fun to pretend! Except I’ll always look like a fake, because I just don’t feel the “gloom” (play Chez Goth and you’ll know), but I’ve still been shopping black stuff this week. I’ve already tried out the “brutal boots” (make me feel a terrible back-pain the next day) for a night at Kulturruine and I can “kind-of” walk with them. Since yesterday I also own a short black velvet dress (see last post), a black fan and some more “detail” …. Yesterday we went to Willi’s Decadence Party for his birthday. While both Rolland and I were a bit skeptical about the motto as well as the ‘roleplaying’ type game to be enacted there, I still dressed up with all the glitter I could muster. This week-end we spent in Belgium at GRASPOP 2003 festival. Since the camping was only open Friday through Sunday we decided to drive up there and spend one night near Maastricht so we would have to drive only one hour in the morning to get to Dessel where the Festival was at. We even managed to find a nice camping site in Valkenburg (which actually is the center of the hollansk bodirflösser – uhm tourism). We nearly finished the beer we had bought since no glass was to be brought onto the festival site. The next day started out rather chaotic since we were waiting for a call from Alex who was supposed to organize how we would meet him and the Luxembourg group at the festival. He didn’t call until too late of course so we came – despite an awful route description – to Dessel when just about everybody arrived. At Graspop the cars cannot be parked on the campsite (yeah I love Wacken) so we had to carry all our stuff first from the parking to the entry (about 3km) of the Graspop camping. There was a huge ‘line’ (rather a mob) of people waiting to be let in. We were expecting they’d control all our bags so there would be no ‘glas,wapens,cameras’. Of course Rolland had his camera, I had my huge knife (geez it’s for eating steaks) and we didn’t even know we had glass with us until we found out on sunday morning we had a glass of nutella. Luckily we managed to get through that waiting mob by going right to the left of it all and we had to wait only one hour. Inside we were greeted by Alex, Roland and Kim. They had reserverd some space for us next to their tents – or so they said. When we came there somehow there was no more space. Oh well. The next open space wasn’t that far away and we started putting up the tents and of course the barbecue. What’s a festival without tons of steaks? The first bands were already playing but what the hell the first ‘really important’ bands weren’t due until later in the day. After some rest we went to the festival grounds where we met pouting Alex – there was no mead sold anywhere! I’ll not write about all the bands or so, since I liked some better and some less. I’ll write about what I liked most of course. This was the second time I have seen O P E T H. Their show is the same “We are Opeth, and this is Deliverance” but that’s okay and even somewhat unique. I also liked the part “I guess we played our songs too fast so here is an extra one”. The sound was good, and this time I even knew half the songs they were playing. Well with a couple times being at “Das Fest” and twice at Wacken this has to be my best concert so far: Within Temptation. So I knew only one CD and that not by heart but this was the band I went to Graspop to see. And I loved every second of that concert which is the first time neither my knees nor my back started hurting half way through it all. On their homepage they call themselves ‘Gothic Metal Gods’ – I agree, though around here noone knew them before Graspop and I only knew them because I downloaded one of their songs once! Maybe I’ll write more later about this most memorable part of Graspop. I guess it is good to have seen Iron Maiden play. They are good but I was still high from the Within Temptation show and a little bit stressed out because I had lost Rolland and the others. So I heard it all and saw all but …. Other bands that played were Stratovarius which I liked half and half didn’t. Lacuna Coil was right after Within Temptation and so I didn’t quite notice them which is too bad since their sound was better this time than at Wacken 2001. I missed out on Alice Cooper because I had lost the others and gone back to the tents. I also missed Six Feet Under and Type O Negative because my knee hurt a lot and I could not stand anymore. Anthrax we listened to while sitting farther back. To me that’s mostly noise. Same for Sepultura. Which somehow reminds me of when I was younger …. …. as far as I know Within Temptation is playing at the Summerbreeze festival again which is nearby so we could just go there for a day to see them again …. Update: They are also playing at the Mera Luna festival which features a lot more cool bands (from my perspective) than the Summerbreeze so we are going there.